Ah, March. I'm tired of all the winter birds, and spring birds haven't come yet. Plus, I'm stuck in the office most of the time and it's cold and it's raining probably. What's a bored birder to do but dream of birding in faraway lands and in warmer temps? 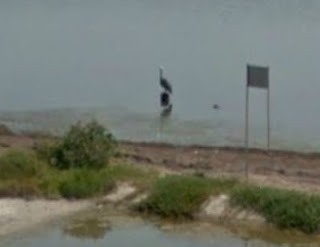 I was perusing Google Street View the other day when it dawned on my that it just might be the cure for my March birding blues. 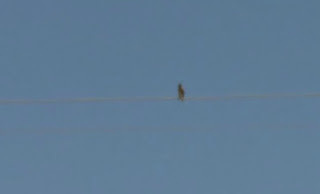 A car travelling all of America's roads taking 360 degree video must have seen a few birds along the way, right? How many could I find? My task instantly overwhelming my brain, I cancelled all my other appointments (none), asked my secretary to hold my calls (I don't have a secretary and no one was calling), and set to work. Turns out, birding on Street View is a lot harder than I thought. 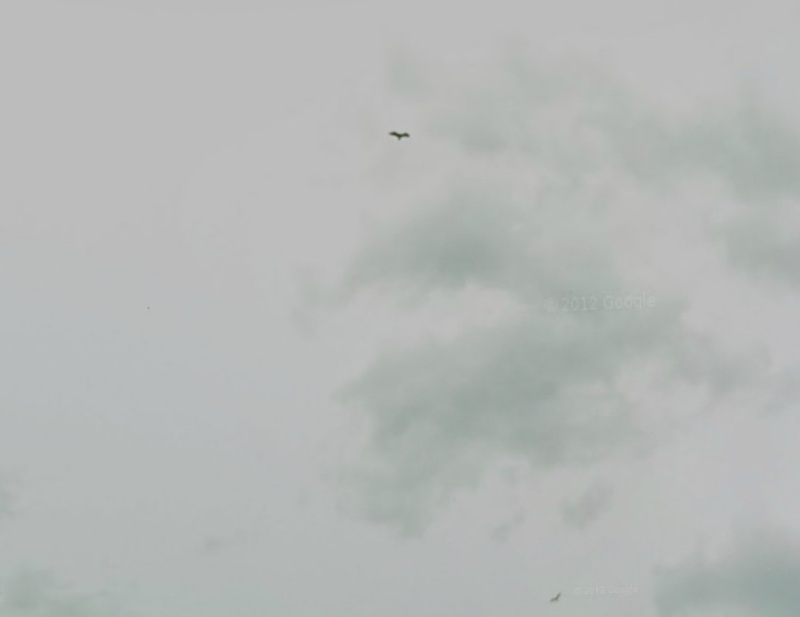 Some of the images were taken more than 5 years ago, and the resolution isn't any good. Sometimes, the weather was bad. Mostly, though, there's just so many places to search! There's a new set of images every 10 feet or so, and scanning the images looking for winged needles in the haystack is quite the endeavor. I searched for gulls in Maine with no luck; Bald Eagles in Homer, AK but came up empty; couldn't even begin to think of where to look for roadside Red-tails. I started to focus by looking for gulls on causeways, figuring gulls were big and easy to ID and often flew right next to bridges. 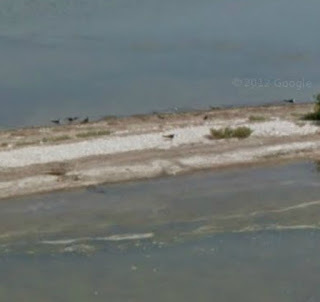 Along Route 1 in the Florida Keys, I found my first hit: Laughing Gulls (click to enlarge). I wanted to get a bit more targeted. 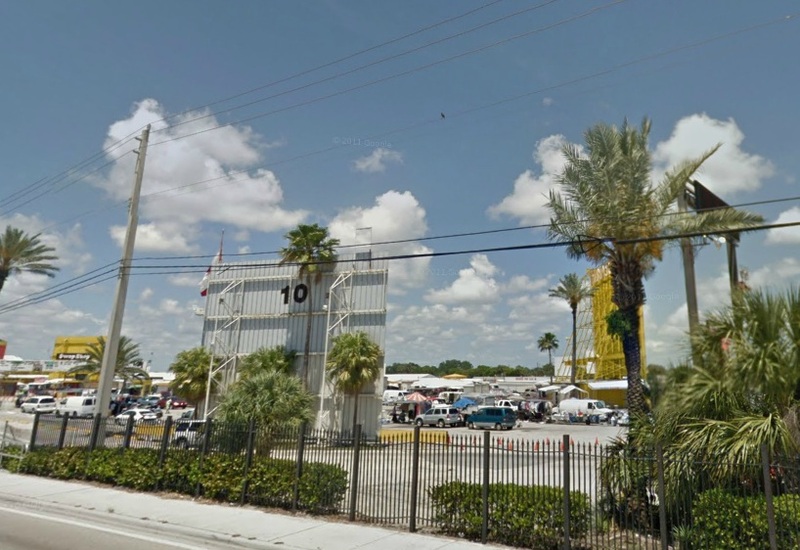 I thought about places I had birded from the roadside, and then took a trip to Fort Lauderdale. 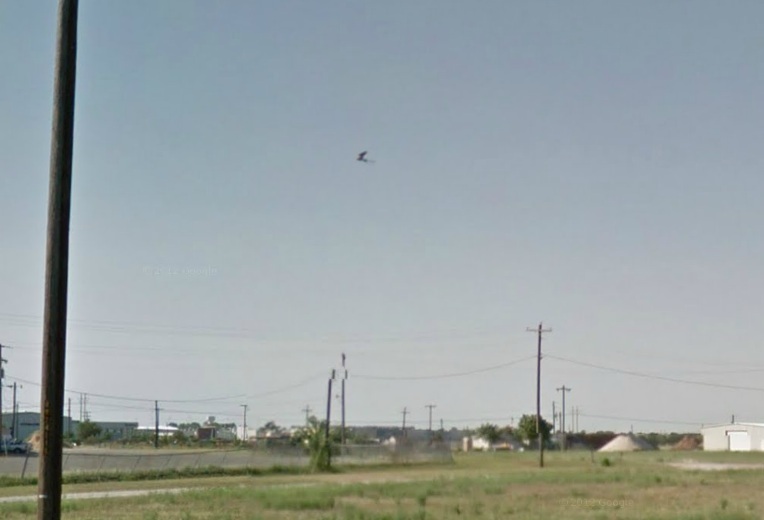 Back in 2006 I found my first Common Myna while driving back and forth across an intersection by some kind of flea market circus thing (is my memory anyway). I checked my eBird report from that day and aimed my cursor at West Sunrise Boulevard. 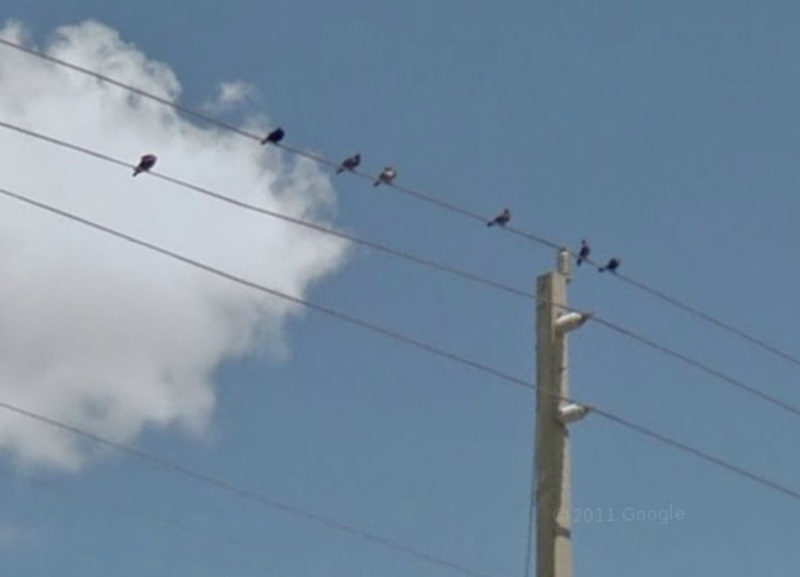 Sure enough, there was the circus thing, and, on the wires, were birds. Hmmmm. About the right size. About the right posture. 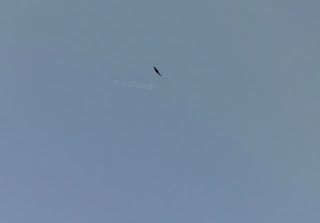 Frustratingly low resolution. It's either a Myna or a Starling, I think. 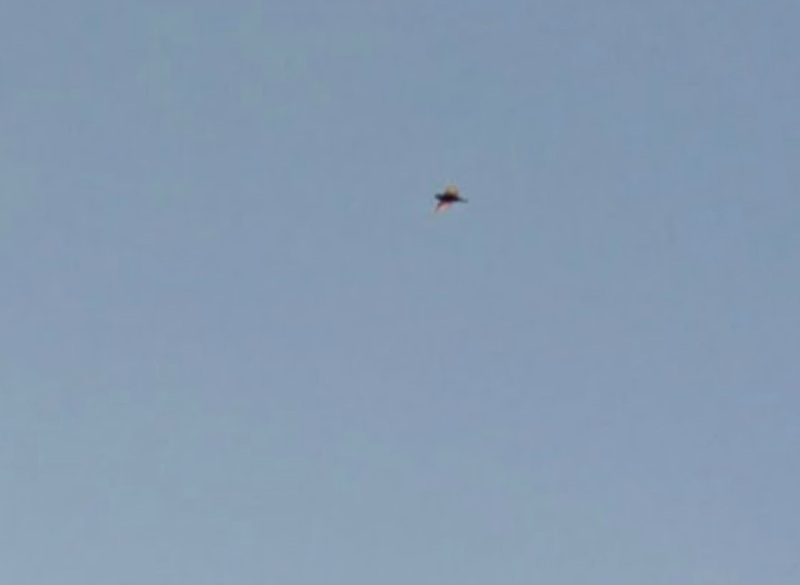 The brownish tint on the belly in the third photo suggest Myna, but I don't see any yellow anywhere. Intriguing, but I won't make a call. 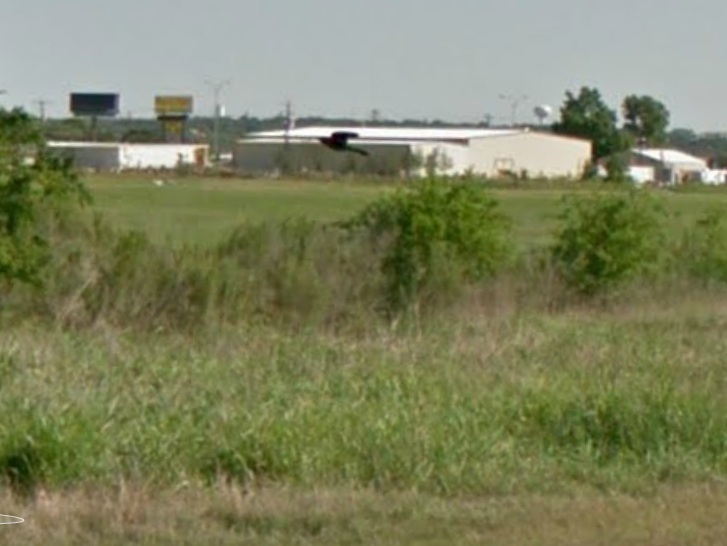 I wanted to try to find some birds that would be easier to ID in low resolution, so I went to Texas. 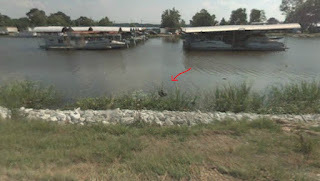 One thing about Google Street View is that the driving seems to all have been done in the summer, so to find the bird I was looking for I used eBird to find some summer hotspots. 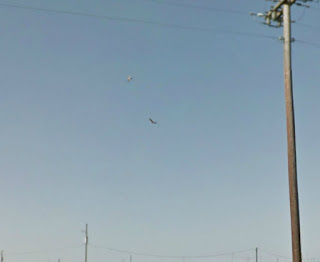 Along State Park Road in Lockhart, Texas I found these two birds soaring above the road. 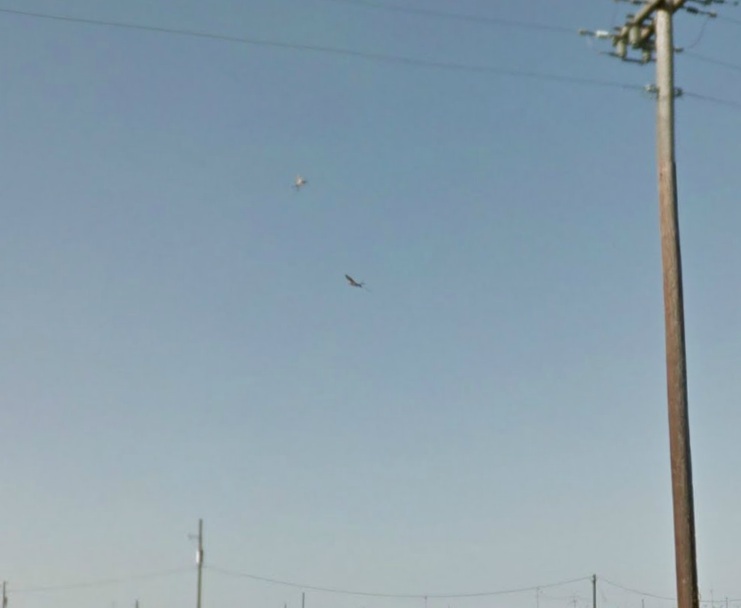 Turkey Vultures, is my guess, but not the bird I was looking for. 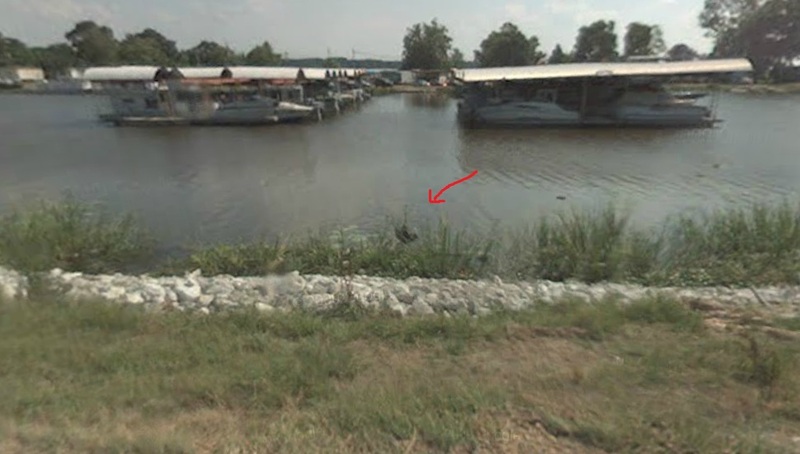 Then I found this little guy. 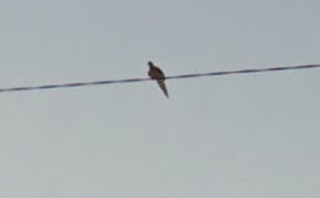 The cool thing about Street View is that because it takes a picture every few feet, you often have multiple angles to look at a bird. 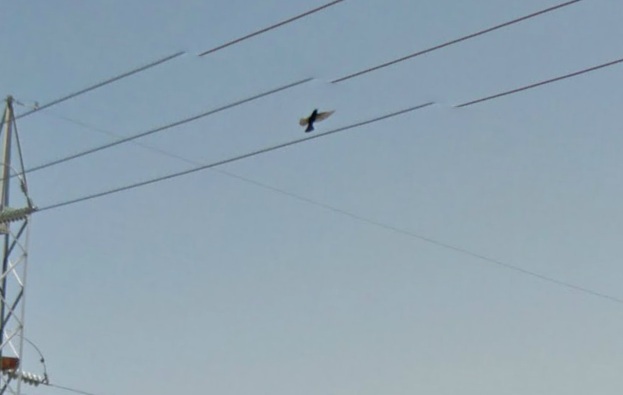 This guy is shown first landing on a wire, then flying back across the road. For the life of my, I can't figure out the species. If you can, please leave a comment. Still not the bird I was looking for, though, so I went to some place called Civic Center Circle in San Marcos, Texas. 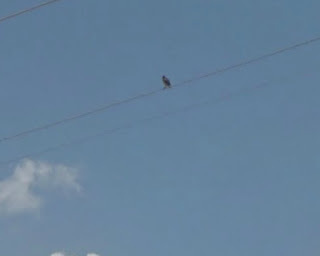 The first bird I spotted on a wire was an easy enough ID, a Mourning Dove. 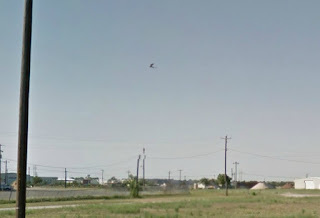 I caught the second bird in flight across the road. Big and bulky, my guess is a female Great-tailed Grackle. Almost all the way around the circle, I finally caught up with the bird I was after. 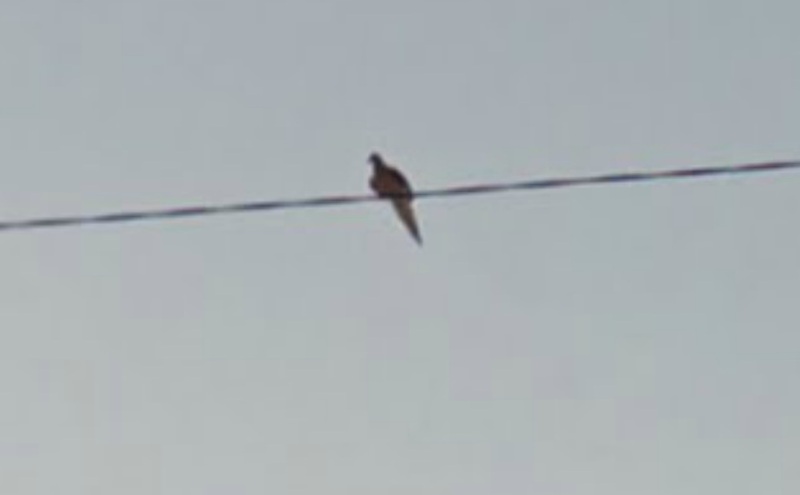 With some unmistakable streamers, you can ID a Scissor-tailed Flycatchers even in low resolution. Looking back from further down the road, you could see there were a pair of them. Now off to south Texas (the resolution in Texas is very good, much better than, say, Ding Darling in Florida) to find Roseate Spoonbills. 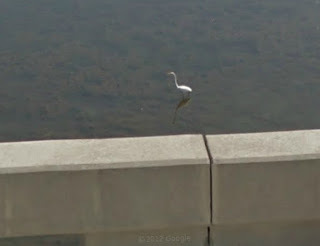 I checked the JFK Causeway to Parde Island, and it turned out to be pretty birdy. A Brown Pelican on a stump. A Great Egret in the shallows. 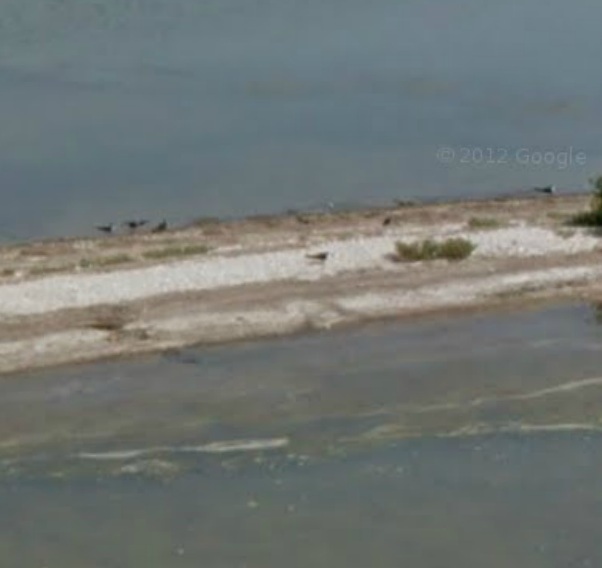 And what look like Black Skimmers on a little island. No Roseates, but a good haul. 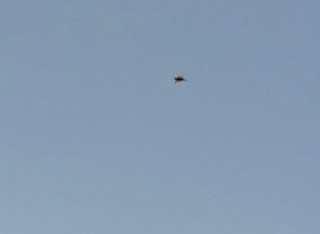 While you were doing this, the rarest bird you'll ever see flew over your house and you MISSED IT!!! Anonymous - My first angry internet comment from someone too scared to leave their own name! I feel like I've hit an important internet milestone. Uncle Jas - Thanks for the daps, dude. 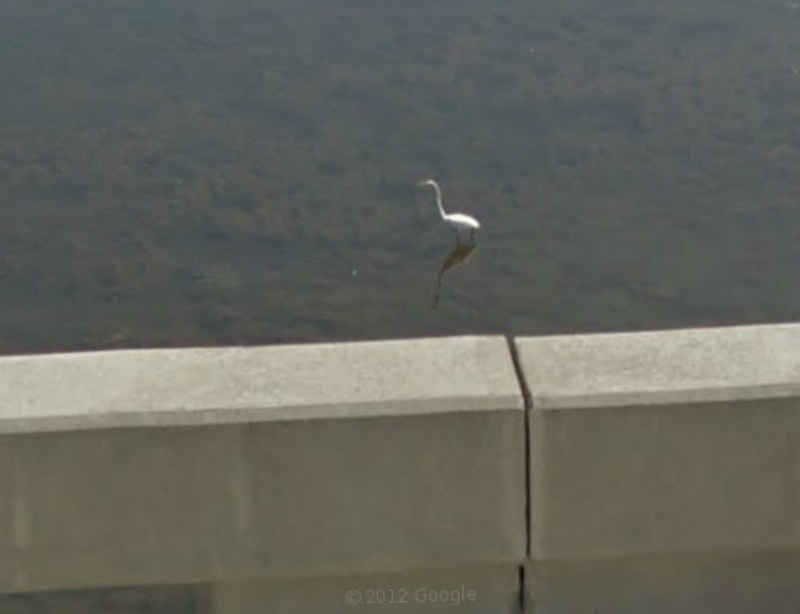 Good birding. 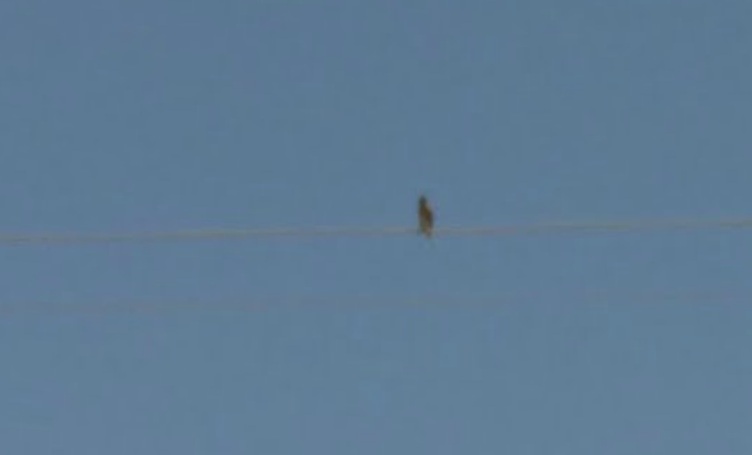 oh, and my best guess at the mystery bird is Indigo Bunting. 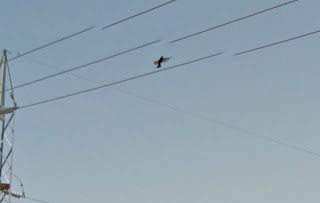 The bird flying up to a wire towards the middle of your post looks a bit like an Indigo Bunting, if it was taken in the eastern US. 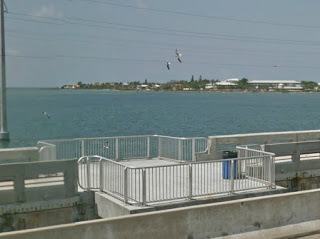 Your first birds, the laughers in yhe Keys, show's Duck Key and the Hawk's Cay Resort in the back ground. My father-in-law used to live there. The two tallest twin Norfolk Pines on the island were always great navigation aids to us whether we were coming home on Rt 1 or returning to the docks from a day chasing Boobies out at sea. Great blog site, btw! -I love it!! 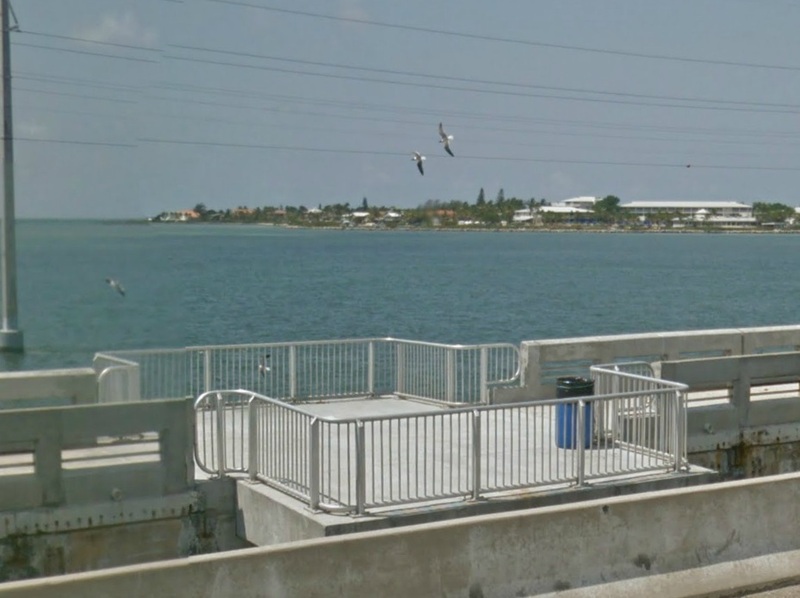 I forgot to mention that Duck Key is a great little place to bird. In the winter the tidal flats are LOADED with shorebirds, waders, terns, and occassionally ducks and loons. The interior of the key is good for Warblers, Painted Buntings, Ground Doves, White-crowned Pigeon, and Broad-winged Hawk. Btw, I don't live there... I'm in MD.